So Many Paths to Choose from... How Do You Choose One? You are at:Home»Articles»With So Many Paths to Choose from… How Do You Know Which Is the Best Barefoot Writing Opportunity for You? With So Many Paths to Choose from… How Do You Know Which Is the Best Barefoot Writing Opportunity for You? For Dorothy, knowing what pathto take to get to Oz was easy. There was only one! 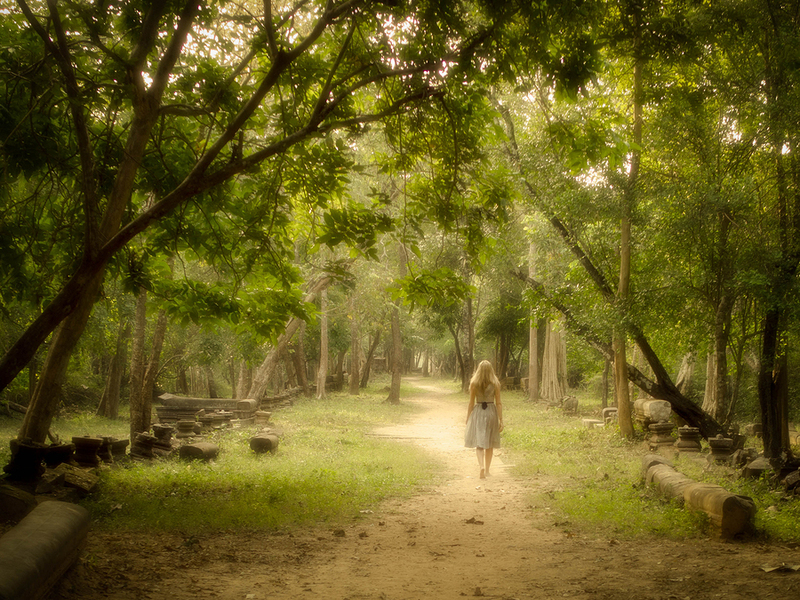 But if you want to become a Barefoot Writer, you’ll find there are many paths that will take you there. For example, let’s say you’re interested in copywriting, writing a money-making website, and becoming an Internet researcher. The question you may be asking yourself is: where should I start? I get that question on a daily basis. Readers email me a list of the opportunities they’re interested in and ask me which one I think they should start with. And my response is usually along these lines … Before deciding which path to choose, you needto decide why you’re doing it. For example, are you looking to quit your job as soon as possible? If that’s the case, you should first figure out how much money you need to make in order for that to happen. Let’s say you determine you need to replace yoursix-figure salary. Then you’ll want to choose a path that’s proven to result in higher than average incomes quickly, like copywriting, web writing, and even grant writing. Ed Gandia was the single provider in his household, with a wife and new baby, when he decided to become a Barefoot Writer. But as a successful salesman, he needed to replace a hefty six-figure income before he could make that leap. So he made the decision to focus on a specific copywriting niche, writing copy for businesses wanting to sell their products or services to other businesses, also known as business-to-business. a year. But the daily commute was killing her. So she decided to become a copywriter, too, but focus on a passion of hers: the self-help niche. That’s why, out of the three opportunities I listed above, if you were to say you wanted to quit your job and replace – or improve – your salary, I would recommend startingwith some form of copywriting. And if you’re looking to move quickly, I would recommend taking AWAI’s Accelerated Program for Six-Figure Copywriting. It will teach you everything you need to start working as a copywriter. Are you looking to develop a passive income stream? Maybe you’re not looking to make the leap to a full-time, work-at-home professional right away. Or maybe you’re already working as a writer and just want to create an additional revenue stream that doesn’t require a lot of extra time each week. Whenever that’s the case, I always recommend writing your own money-making websites. If you’re looking for an easy business you can launch and not spend much time developing your skills, then I’d say start with Internet research. If you’re not familiar, a money-making website is simply an information website on a topic you’re interested in that’s designed to attract web visitors who are searching the Internet for information on the same topic. Once those visitors arrive at your site through various methods, they are turned into a passive revenue stream that comes in whether you’re working or lying on the beach. Barefoot Writer Brigitte Bradtke writes a website about an Australian wilderness region known as the Kimberley. She brings in about $10,000 per month – and only works six months a year. Susan Loui from Honolulu, Hawaii, who started a website about tourist attractions. Elizabeth Chavous from Jackson, Michigan, who launched a site about loose leaf tea. Beth Strauss from Cleveland, Ohio, who wrote a site offering advice and support for working mothers of twins. Suzanne Elliot from Santa Cruz, California, who is writing a site about landscape painting. David Boaz from Houston, Texas, who’s sharing his knowledge of vegetarianism with the world. Harry Kroyer from Magdalena, New Mexico, who is takes the mystery out of baking bread from home. And those are just several of the hundreds of Barefoot Writers writing money-making websites to generate a passive income stream year after year. Well-known online copywriter Nick Usborne has actually perfected a method for creating money- making websites with very little work, which he shares with you step by step in his program How to Create Your Own Money-Making Websites. His own websites, including one centered on teaching beginners about gourmet coffee, bring him an additional $50K each year, working only a few hours each week updating his websites. That’s on top of the money he makes as an online copywriter. Are you looking to make a little extra cash on the side? Maybe you’re a stay-at-home mom who’s only looking to work 10-20 hours a week. Or you’re recently retired, don’t feel like spending a ton of time developing a new skill, and just want some fun money. Or you have a thirst for life and just want to make enough to get by so you can spend the majority of your time playing and exploring the world. Whatever the reason, if you’re just looking for an easy business you can launch and not spendmuch time developing your skills, then I’d say start with Internet research. In this opportunity, you actually help copywriters track down facts, figures, statistics, and other information for their own writing projects. Since copywriters get paid very well for everything they write, they’d prefer to spend all their own time writing rather than doing any research. They’re more than willing to pay you as much as $50 per hour to do the research for them, and since all the information is found online these days, you basically get paid to surf the web. Sandy Ferguson has made a career out of doing this type of research and shows you how you can do it too in her program, Secrets of Becoming an Internet Research Specialist. The point is you have to start somewhere. And ideally, that somewhere is the place that matches your current situation and needs. I’m not saying you can’t do more than one opportunity. In fact, I always recommend you create multiple revenue streams for yourself rather than putting all of your eggs in one basket. But you have to START doing one before you can add on another. Personally, I’m a marketer, copywriter, and web writer, and I own a money-making website. But I started as a marketer, and then continued to turn my experiences and skills into new revenue streams for myself. Barefoot Writer Julien Sharp may have started out as a resume writer … but she now also makes a great deal of money as a social media expert. And Cassandra Lee may have started out as a graphic designer … but then she added copywriting to her services to increase her project fees with each client. You can do it all. But you have to start somewhere. So choose a path and get started! I am very interested in becoming a Barefoot Writer. I am a bit nervous about it. I would love nothing more than to be able to work from home and live a very comfortable life and after reading several articles here I see that it could be possible but, I am needing solid confirmation that this is what I am to do. I would love to receive more information about others who have chosen this as their source of income. Glad to hear it! I was plenty nervous too, just starting out, but after seven years now of writing and working from home… I wouldn’t trade it for the world! Here’s a good list of other writers who took this path: http://www.thebarefootwriter.com/working-barefoot-writers. Feel free to reach out to them – they’re a friendly bunch! Another inspiring list of writers can be found here: http://www.awaionline.com/wall-of-fame/ (AWAI is our publisher). Best of luck! Would your organization be a good source if I wanted to publish a book I wrote? Would it be a good source to do editing part-time? I write Christian Poems was preparing to publish my book but it’s out of my league right now. I’m interested in your program but have no funds also more interested in Christian faith writing. I feel like a full time student. I’ve purchased enough online informational products to buy a new car. I know I need to start at something and ACT. My goal is to replace my current income quickly. My current income is not that much at the moment, so it shouldn’t be that difficult. 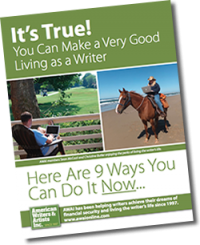 I am more interested in the freedom freelance writing will give me than the money. Don’t get me wrong. I need the money and want to make a comfortable living, but freedom in this next year will give me an extreme sense of relief. I have just become a member of The Barefoot Writer and will spend the next few days reading the material I’ve been given. I will reach out for advice, give myself goals to achieve, and I will commit to writing 500 words a day. My name is Marcia Bradford and I just joined the barefoot writer’s club on Friday. I just love to write, I have been writing encouraging letters and emails to my family and friends for years. I joined the club to get some more training. I love being at home after being force into with retirement some years ago while being a caregiver. My first question is probably premature but I am so excited and a little fearful about what I can do with this membership. I have been reading all of my downloads since Friday. My first question is about the building a website, do we have to have that website to start or came we apply for some of the jobs on the job board? My first interest is in writing for a Christian association of some kind. This all sounds good. I’m wanting an income to suppliment my retirement. I want to live comfortably with no financial worries and be able to have lots of time to pursue my interests. I need to work from home. I worked in an office for many years and I felt trapped and creatively stifled. I need to be my own boss. I have just joined the Barefoot Writer’s Club and the AWAI and I am frozen getting out of the gate. What about these letter writing opportunities that are mentioned? I am only seeing work for experienced copywriters and they require writing samples and CVs. Help me out here so that I can at least get something for my money. Same. I downloaded all the items with links to download. Now where?